Prairie lost its starting quarterback early in the game and struggled on offense the rest of the night in Kelso. Now Falcons look to regroup against first-place Mountain View. The Falcons got the ball first and they were heading in the right direction. Quarterback Jayson Maddux scrambled for a gain of 18 yards on third-and-14 for one first down. He spotted a receiver open for another third-down conversion. Then everything changed for the Falcons. Maddux got taken down by a Kelso defender, and Maddux did not immediately get up. Season over for the starting quarterback. The next play, Kelso intercepted a pass, would go on to score and never trailed. This is not to claim that Prairie would have won had Maddux not been injured. After all, Kelso won a lot to a little. But my guess is Prairie would have been able to put up a tougher fight. Not only did the Falcons lose an athlete, it also was a mental letdown, losing the leader on offense. Get well Jayson. See you next season on the field. Aaron Brumley had a key series on defense for the Falcons. Kelso snapped the ball over the quarterback’s head, and the QB hustled to get to it on time. But the QB also tried to turn and run. Brumley was having none of it. He tackled the quarterback for a loss of about 16 yards. On the next play, Brumley and Ken Miller teamed up to bring the ball carrier down for no gain. Kelso would punt on this drive. Later in the first half, Anthony Estrada stayed home in his assignment and was in the right place at the right time for an interception. He returned it 35 yards of Prairie’s only points of the game. What does Week 8 and 9 mean to Prairie? The Falcons take on first-place Mountain View in Week 8 and last-place Fort Vancouver in Week 9. If the Falcons go 1-1 in those games, they will finish 2-3 in league and hope to finish in a three-way tie for third place with Evergreen and Hudson’s Bay. If this sounds familiar, it is exactly what happened a year ago. If that happens, there would be a three-way tiebreaker for the third playoff spot. 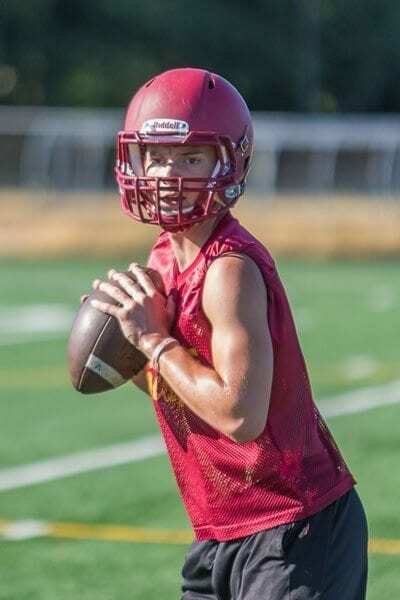 Of course, the Falcons would love to surprise the 3A GSHL world this week by beating Mountain View with their back-up quarterback. If that does not happen, expect Prairie to win in Week 9 and see about the rest of the results involving Bay and Evergreen games the next two weeks. MVPs: Although we had several who fought hard and played their positions well, we couldn’t come up with anyone on either offense or defense who performed well enough to be considered the most valuable player.